You’ve seen our standard motorcycle disc lock review here. 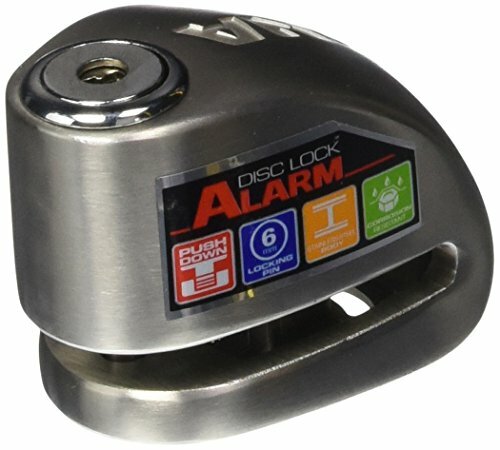 Now it’s time to introduce you to another level of product on the market which is the alarmed disc lock. 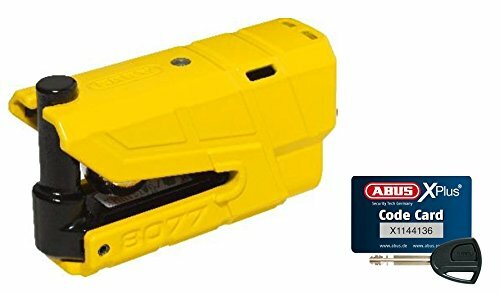 Similar in use to their non-motion detection cousins, these products are a great way to add an additional level of theft protection to your arsenal. These start with your top of the line, large diameter bolt setups featuring a siren rating of up to 120 decibels before slowly reducing in price point and specification. 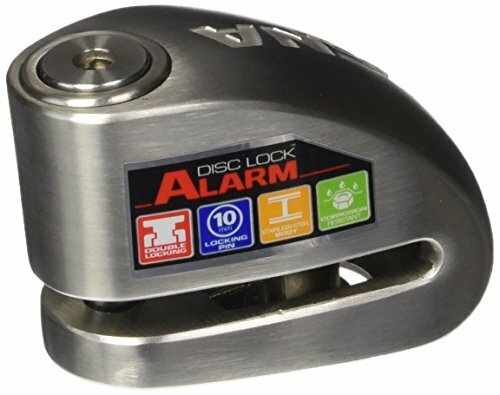 The cheaper disc lock alarms on test are still worth considering but due to their smaller bolt sizes, just can’t stand up to the same level of abuse as their larger counterparts. 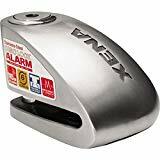 Welcome to our best motorcycle disc lock alarms round up and review. Abus’ newest entry onto the market is nothing short of huge in every sense of the word. The hardened steel body features a 16mm locking bolt, the same size you would find on some of the strongest D locks and padlocks on the market. Due to its size, this is going to clamp over the radius of the disc instead of through one of the many drilled holes present. Abus have included what they call an automatic brake disc recognition system which means that when in transport, it will never accidently trigger and sound its siren. And it’s a good job too as the minimum sound level of this lock is 100 decibels. You’ve also got a 3D detection system which means that any type of movement at all whilst armed is going to result in the siren sounding, including vertical lifts off the ground. In the case of an accidental ride off attempt, the lock will let you know it’s still attached with audible beeps, giving you a just enough to disarm and remove it. The device weighs 2.64 lbs (1.2 kg) so whilst heavy it is still portable and should fit under most seats. Abus have a template on their website so check to see that this one will fit (due to its large bolt) before making your purchase. Xena’s XX14 just misses the top spot due to a slightly small bolt diameter of 14mm. Otherwise the feature set is very similar. 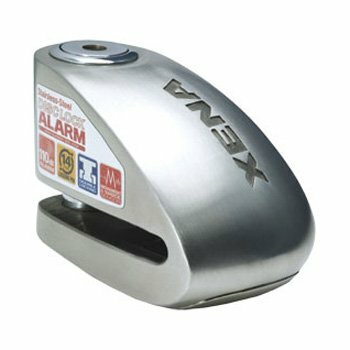 You have a stainless steel metal body, housing an alarm capable of delivering up to 120 decibels of pure volume. The idea being that being in the immediate vicinity whilst this is going off is going to be very painful to the person trying to steal your bike. It will also of course let everybody nearby know that someone is up to no good. 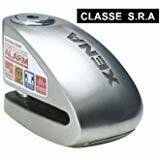 Xena have updated this model to address a common complaint which was that this lock was just a little too trigger happy and would go off with a slight breeze. This should no longer be the case whilst still maintaining great detection of movement and tampering. The siren also has an auto arm/disarm function so you only have to remember to attach it and remove it. The larger XX15 is also available if you need the extra disc clearance. Both are also available with a chain adapter which is sold separately. The idea here is that you can then attach a security chain to your disc lock and then onto something else like a lamppost for added protection. The XX14 weighs 1.63 lbs (0.74 kg) and will fit under most seats. Back over to Abus and we have another GRANIT Detecto model. Using a similar design to the non-alarmed Sledg 77, the 8077 looks and feels familiar. Security is brought to you by a 13.5mm bolt of hardened steel with the same steel used for the body. 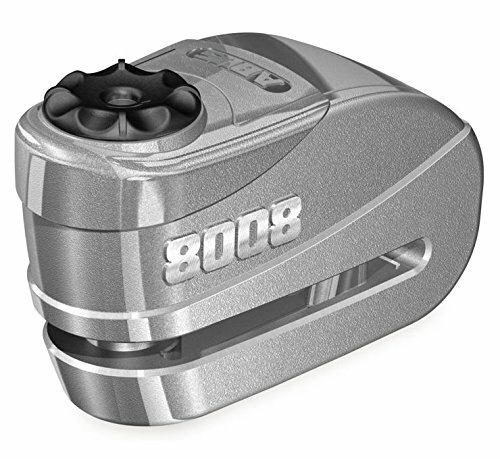 All of Abus’ motion detection technology has gone into this model as well as the 100+ decibel siren. As with the 8008, no false alarms were experienced under testing. We also liked the LED light on this one, capable of displaying a range of colours to show activation, alarm and battery status without having to take the unit apart. As always, check to see if it will fit your disc setup. 1.94 lbs (0.88 kg). Next in the Xena range is the XX10. This time you’ve got a 10mm locking bolt which is still respectable and trumps a number of other products on the market. The all stainless steel body is of the same construction as the XX14 and still features the double locking mechanism making it tamper proof and unsusceptible to being picked. Siren volume is the same at 120 decibels which is nice to see. Usually manufacturers will attempt to cut costs with lesser models in their product range but that isn’t the case with this line up. This one weighs in at 1.34 (0.61 kg). 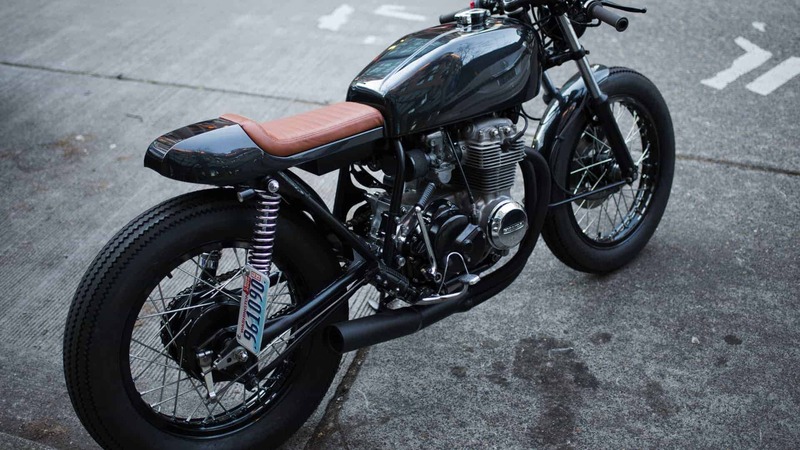 Finally, we have a lock for the smaller motorcycles out there. The XX6 is the smallest and lightest on test 0.92 lbs (0.42 kg) but still features a 6mm locking bolt giving you a decent level of protection, whilst still giving you a few options on how to mount it (across the entire lip of the disc or through a drilled hole). Once again, 120 decibels are supplied on a triggering event, lasting 15 seconds before rearming and repeating if necessary. You only get pushdown locking here and not the double mechanism on the more expensive models so weigh that up with the risk present wherever you frequently park. We hope you found this review and roundup useful. There are number of products out there but we feel these represent the best motorcycle disc lock alarms available. As always, feel free to send us a message with your experiences.